Team Ky’s finest, L 2 R: Darion Dearinger, William Long, John Young, Brandt Babin, and Braeden Babin. The article this morning is landmark for several reasons. One, my youngest daughter turned 15-years old today (Happy birthday, Caroline). Two, this is KPGFootball’s 1,000th article published in under two years. We decided to write about something pretty important, at least to us, in celebration of our 1,000th article. KPGFootball has chosen to write this morning about a phenomenon about which you may not know but which is very legitimate and yesterday, at Kentucky’s annual Spring Football scrimmage, was both very visible and very real. In today’s article KPGFootball will travel down memory lane a bit before circling back around to the present. 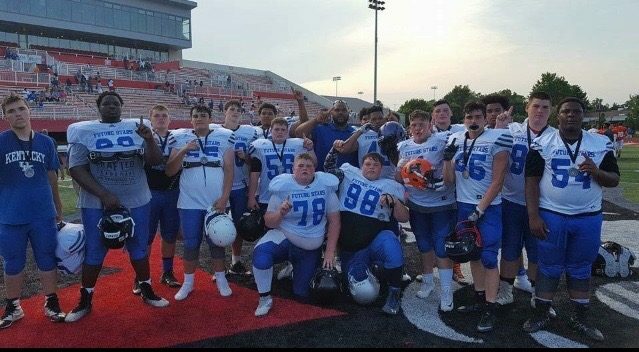 The year was 2016 and seven kids from Hopkinsville had made either the 7th or 8th grade future stars game. There wasn’t a sixth-grade game at the time. My mother called the local paper believing it to be newsworthy. The person to whom she talked, who is no long with our local paper though this scenario had nothing to do with his leaving (left for gainful employment), related to her the paper didn’t report on middle school football. So beginning April 30, 2017, we decided we would. 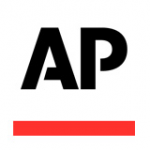 The bottom line is, KPGFootball was started to cover football, even the football the print-media deemed too unimportant for which to spill any of its ink. So, that is what we have been doing. We began very early on covering the most prestigious of all of Kentucky’s all-star teams (Our editorial opinion), the Team Kentucky Future Stars. Team Kentucky Future Stars had created, branded, and widely disseminated the hash-tag, Brotherhood. #Brotherhood is now a commonwealth-wide accepted way to denote one is covering either a present or former Team Kentucky player or event. Admission into the #Brotherhood is similar to Hotel California…one may earn his way in; but one never leaves. A coach flippantly told me one day he too wanted to be referenced with #Brotherhood. We told him he wasn’t entitled to use the reference or the hashtag. You see, he had never played for, coached, or exclusively covered Team Kentucky. The hashtag is reserved for a select few. KPGFootball has checked with the hashtag’s creator and we have been deemed a part of the brotherhood and fully entitled to use the reference, according to him. Ricco Hughes, Team Kentucky Director, is a “vote of one” in this regard. So today, Team Kentucky is hosting tryouts for the 2019 6th, 7th, and 8th grade games. #Brotherhood is opening the books and will be adding new members. These young men vying for this distinction probably have no idea how big of a deal this is and what it will mean in each of their lives should they gain entry. KPGFootball wishes some of these men could have been un-officially visiting UK yesterday. Had they been there they would have seen #Brotherhood in all its glory, with all its import, with all its influence represented within the prospects being hosted and even on the sideline and rosters of the inter-squad game. 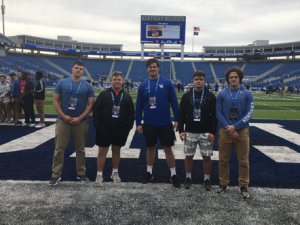 Members of #Brotherhood KPGFootball both saw, and with whom we interacted at some length yesterday at Kroger Field, were Brandt Babin, Braeden Babin, Darion Dearinger, Will Darragh, Zack Russell, William Long, Dekel Crowdus, John Young just to name a few. These boys hugged each other, posed for pictures together, relived good times and war stories from the weeks they each spent at Team Kentucky camp getting ready for the Kentucky-Tennessee annual battle. We parents, perhaps feeling equally bonded, owing to the sacrifices we all had to make for our children to participate; well, we also hugged. What was going on at Kroger Field yesterday was a Team Kentucky reunion of the #Brotherhood. 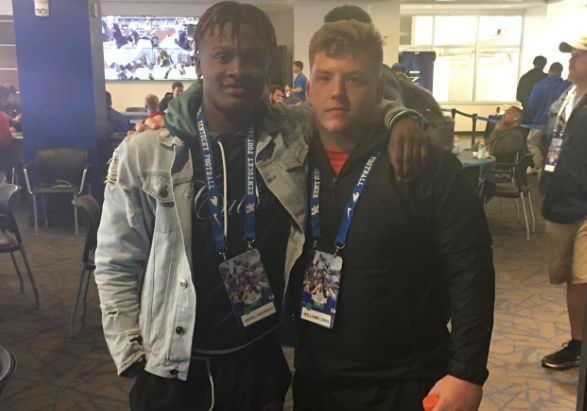 Prospects from #Brotherhood enjoying the moment, players on Kentucky’s football roster whom are #Brotherhood members themselves (Kolbe Langhi, Walker Wood, and Drake Jackson), coming over to chat-up and hug-up their younger brothers whom had come to watch them compete. It was impressive, it was striking, and it was all too real. So here it is folks. Article number 1,000 for KPGFootball. We feel as though we have reconciled ourselves to our past, have found it gloriously satisfying, and are prepared to march forward. Team Kentucky will be shortly adding to the rolls of #Brotherhood. The new Team Kentucky will be released first, right here on our magazine. We will cover this team and enter each name onto the books of the Brotherhood. We will cover them when they camp and we will bring you details and thorough descriptions of what they do in the game. We will report on it, but you have to experience it to truly appreciate what it means. That’s not entirely true, you can at least gain a sense of its meaning and importance by attending anything where the very best football players in each of the eligible graduating classes are present. Anywhere great football players gather, you will find Team Kentucky, you will find #Brotherhood. They may not identify themselves to you; but they will certainly be in attendance and they will know each other. They will both look and act like they are all on one-team even where they may be wearing different colors. #Brotherhood runs this thing we call Kentucky High School Football. For our part, we are just proud to be permitted along for the ride. Thank you for your kind support of both our mission and us. We will be seeing some of you around. #Brotherhood! Reporting for KPGFootball, this is F.W. Long reminding all of the ballers out there that #WeGotUCovered and to PLAY THROUGH THE WHISTLE. Previous Post:2019’s Brennan Emnett is headed to Hanover College…smart play!